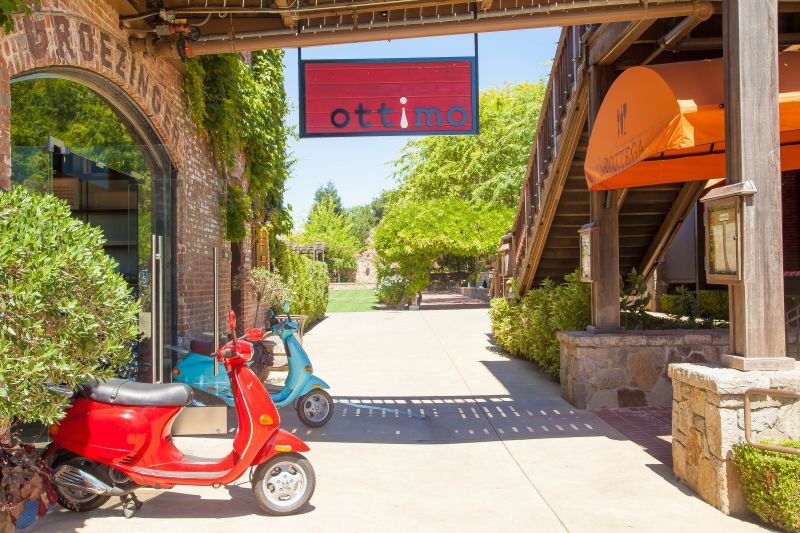 I had the opportunity to grab lunch with a friend at Michael Chiarello’s new restaurant Ottimo, located in the V Marketplace in Yountville. It is situated across from his famous restaurant Bottega. 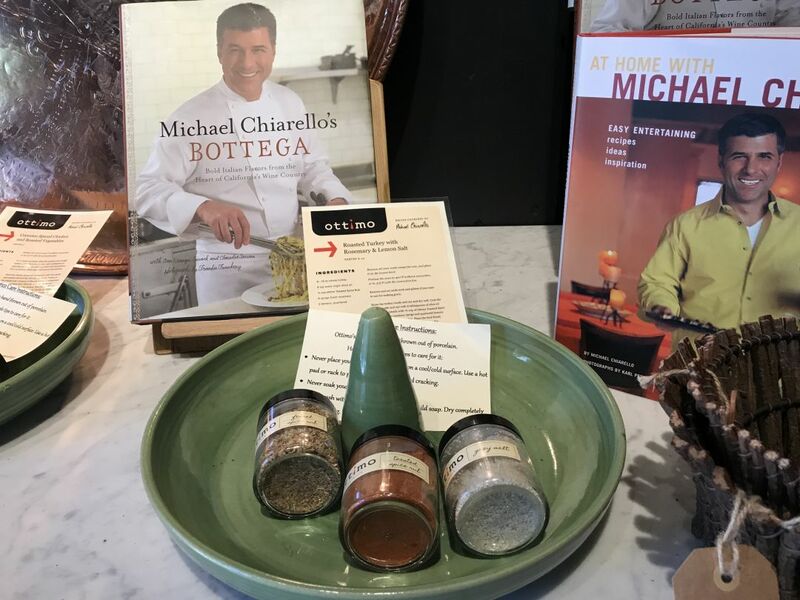 Ottimo is an interesting place, far more casual than Bottega, with a front shop area that sells various cool items from cookware to gourmet salts, cookbooks, oils, vinegar, and soaps. When you see it from the outside, you can’t help but smile at the little, brightly colored Vespa scooters that sit right outside the doors. There is a bright red sign too with the name and an upside down exclamation point used as the i. The interior is done in an eclectic style which matches the variety and selection of things for sale. 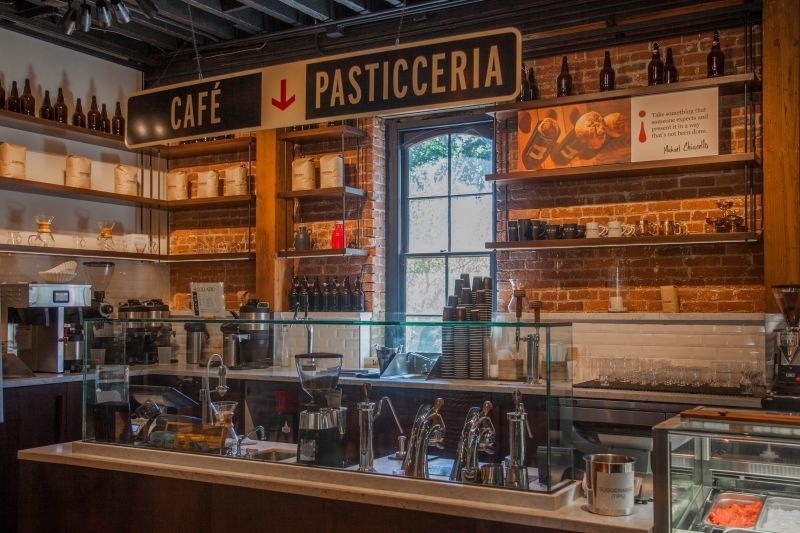 They seem to have “stations” placed around the store where you can purchase different types of food, including a pasticceria (desserts), enoteca (wine), salumi (cured meats), and pizzeria/mozzeria (pizza and fresh mozzarella). 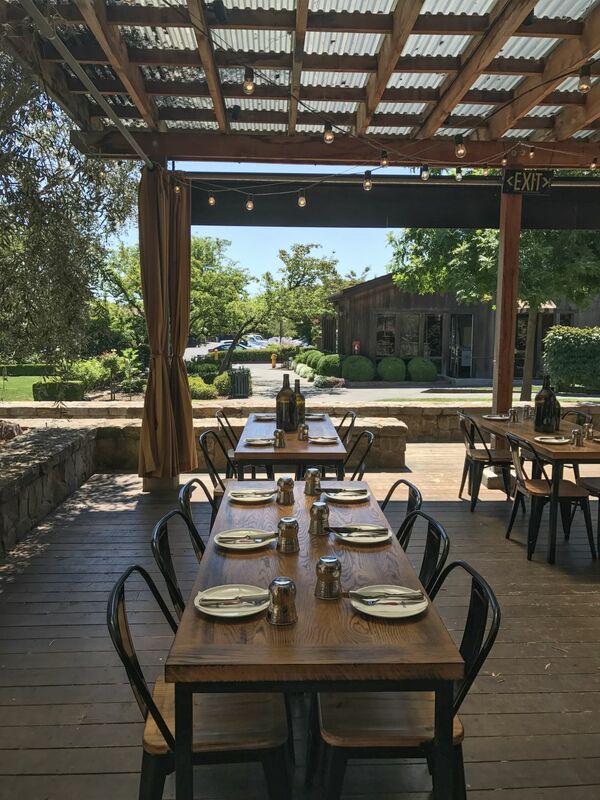 They have used tables on wheels like carts as the main dining area tables so that they can easily be moved around to create different configurations. It is interesting visually, as well as being practical. The outdoor area reminds me of family places in Italy; rustic wood tables and low chairs. It is shaded and has pleasant views all around. We ordered a pizza, a mozzarella salumi plate, and their house Caesar salad. I have to say, it was a lot of food. The portions are enormous. I had expected small salads, but these were large and could be a meal on their own. Let’s talk about the house Caesar salad to start: what was really interesting about this salad was the unique deconstructed way it was served. The romaine lettuce leaves were cut lengthwise and placed vertically stacked in a mason jar. A crostini smeared with minced anchovy was also dropped in the jar. 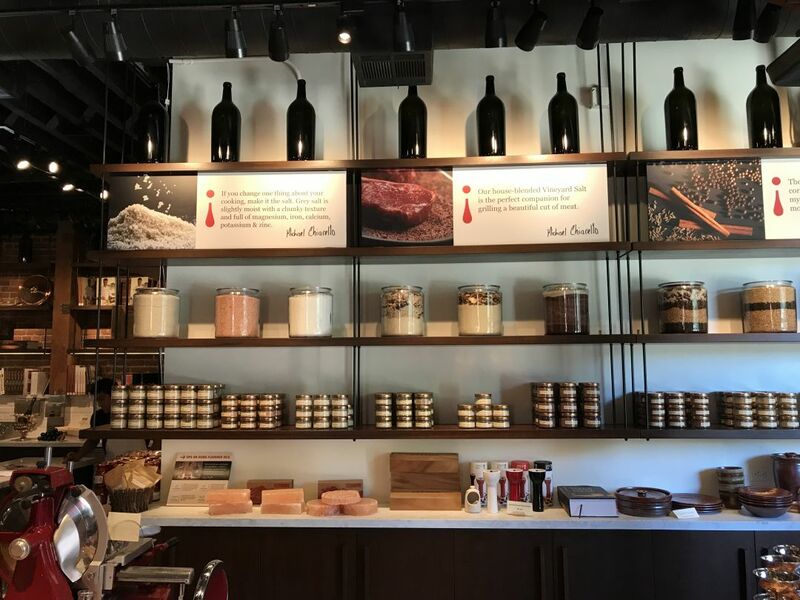 The contents of the jar were all sprinkled with Parmesan. 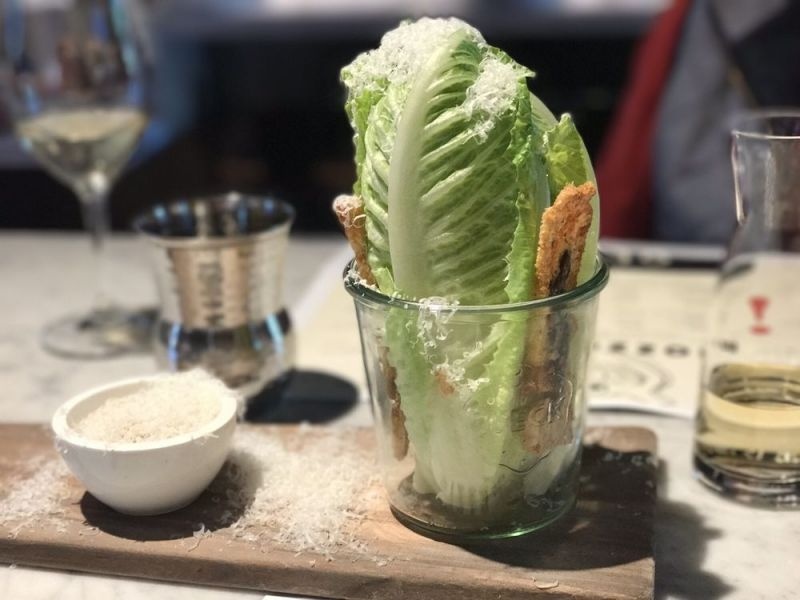 Served on the side was a thick Caesar dressing which featured black garlic in the flavor. I loved this dish, I adored its presentation and flavors. I thought that the dressing was exceptional. Our next dish was the spicy Calabrese pizza. The pizza looked really appetizing on the plate. The crust was fluffy and chewy and had a very pleasing flavor. I didn’t find the Calabrese sausage particularly spicy and the sauce had a good taste. I didn’t care for the pickled onion on the pizza as I felt that the sourness did not really work well with the rest of the flavors. If I ordered it again I would ask for the onion to be caramelized. Then it would have been something truly great. 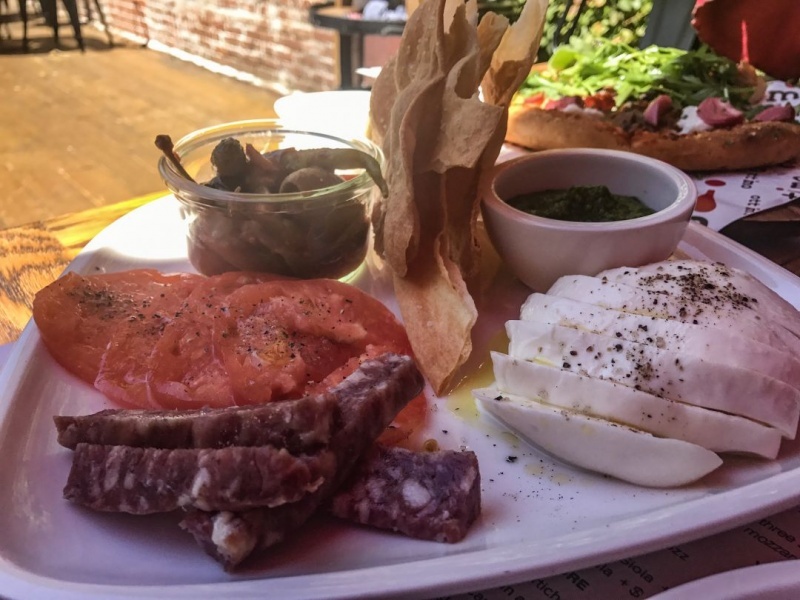 The salumi plate came and with our small table, we didn’t have enough room to spread out our dishes and enjoy them. It was a huge plate, a meal in itself. 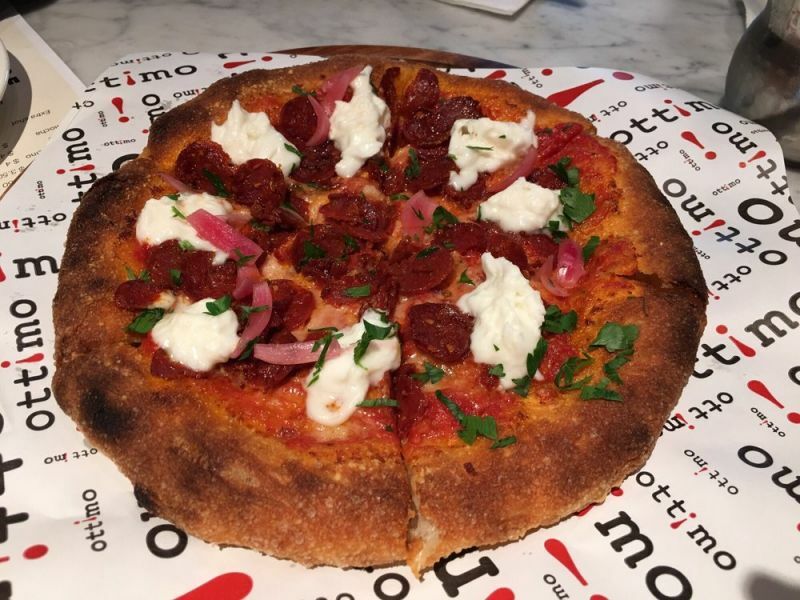 It featured fresh mozzarella made in store that had been drizzled lightly with olive oil then seasoned with salt and pepper, sliced tomatoes, cuts of Toscano sausage, and a mixed cup of olives and pickles. It was served with flat bread and a small dish of pesto. All of the items were beautifully fresh and flavorful. I wish I would have had a balsamic vinegar with the dish. The pickles and olives didn’t quite do it for me. The pesto was good, but it really felt like there was something missing to pull the plate together. My guest and I thought maybe the missing factor was wine. (We were both drinking soft drinks on this occasion). 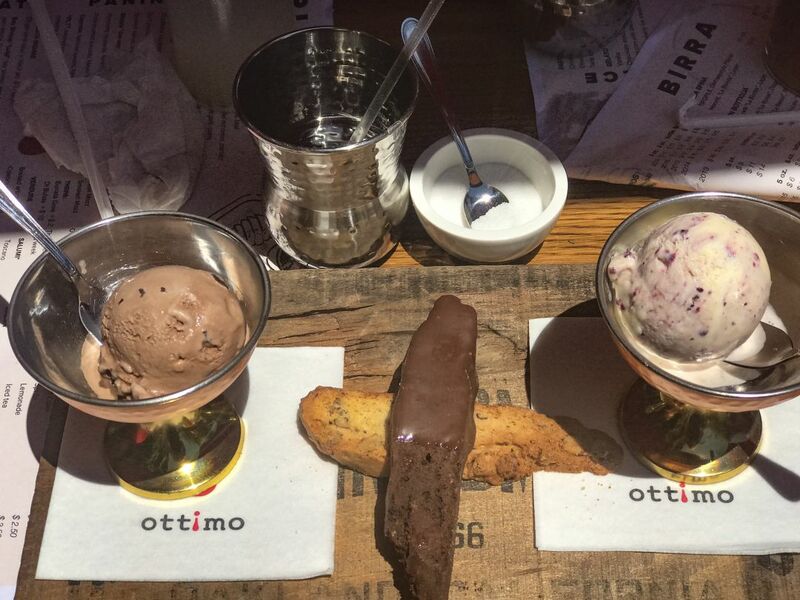 To finish, the chef presented us with two small bowls of gelato and two of their homemade biscotti. The gelato was in two flavors: chocolate stracciatella and corn with blackberry. We both loved the chocolate; it had a great milk chocolate flavor, rich and creamy. The corn and blackberry gelato was extremely interesting and I ate mine trying to let my mind wander over the complexity of the combination of flavors. Both of the biscotti that were served with the gelato were wonderful. One was chocolate dipped, the other a traditional version with pistachio and a hint of anis. Both had a ton of flavor and were the perfect balance of crunchy without breaking your teeth as you tried to chew. I like this place for its casual atmosphere and interesting menu. I loved the attention to detail with all of the plate stylings and serving of the food. 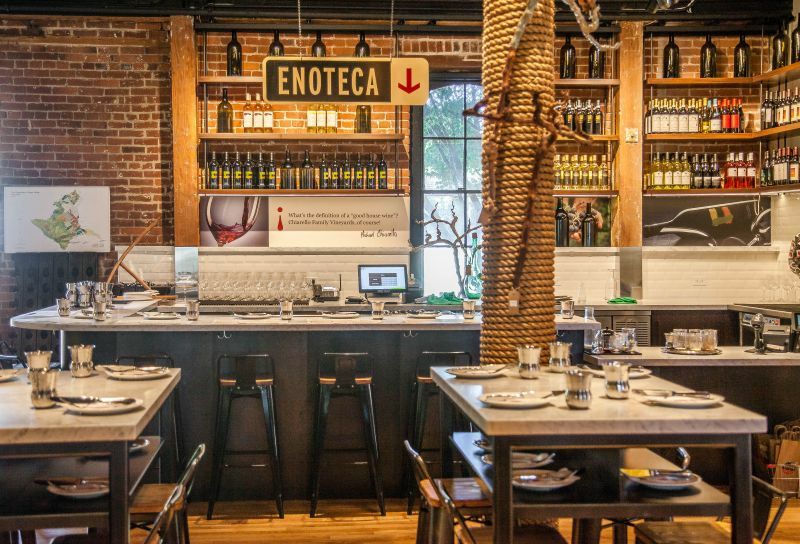 This is a place you go when you want your tastebuds challenged and to channel your inner Italian. Great photos and write up, now I’m hungry! Thank you Jeff! Its a fun place for lunch.